Burr Elm with black edging and elegant scroll inlay. Traditional shaped metal legs, imitation inlaid keys, satin finish. 18 or 36 note movement playing Slipping Through My Fingers. 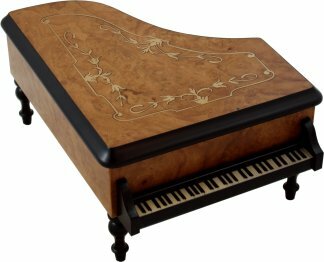 The movement is fitted at the front of the piano compartment under a clear cover leaving a small area towards the back for rings, earings & other small jewellery pieces. This beautiful hand crafted wooden jewellery box is finished in burr elm veneers with an elegant inlaid scroll marquetry set into the lid. 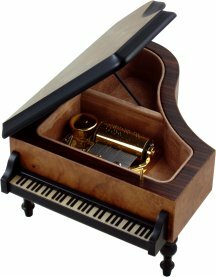 Shaped as a miniature grand piano, open to reveal the velvet lined compartment and hear the musical movement play Slipping Through My Fingers from the film Mamma Mia. Choose between the 18 note or longer playing luxury 36 note movement to be fitted. For more information on the musical movements used, please click here. *Please note, the burr elm is slightly darker in shade than that shown.